The king of the interactive story is back with his trademark multicolour joy and fun bursting out of the pages. 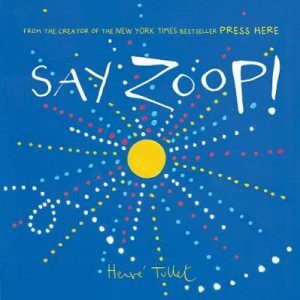 With a style that is often imitated but never quite equalled, Tullet presents us with another example of what makes his books so special: simple, often geometrical artwork, and an instructional text drawing readers in to participate and have fun with books. Tullet focuses on sound here, encouraging children to experiences with their voices, both with singing but also with a bit of acting. This title is longer and therefore suitable for older readers also; it is incredibly empowering and will work wonders for children who might be worried about getting involved in their drama lessons for example, but also provides opportunities for the whole family to get involved! Great fun! 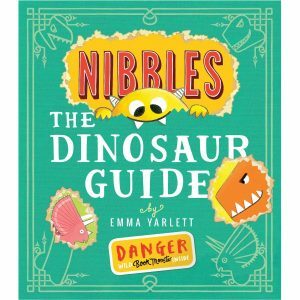 Nibbles the mischievous book snacker is back! This time , he has slid into a book about dinosaurs, chomping his way through the pages and creating utter mayhem, and much fun, along the way. Packed full of detailed artwork, narrative and speech bubbles, the story can nonetheless be accessed on many levels: younger children will enjoy the exuberant hero and his antics and will love spotting him on the page. Older children will be able to enjoy all the information about dinosaurs and grasp more of the humour, which is also multi-layered. With its witty fast-paced narrative, clever use of die-cut holes and flaps and superb book design and production, this is a stellar example of picturebook making. After this successful sequel, I cannot wait to see what Emma Yarlett has in store for us next. Izzy Gizmo loves to invent, but things don’t always quite work out. When she rescues an injured crow, she is adamant that she will help him fly again, however difficult and lengthy the process might be. 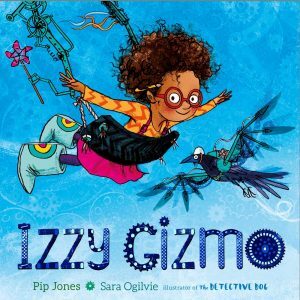 Vibrant and fun, ‘Izzy Gizmo’ is an absolute joy of a story. Pip Jones has created a wonderful heroine and her rhythmic text brings her story to life wonderfully, while Sara Ogilvie’s interpretation of Izzy brings her character to life perfectly. Together they have created the kind of girl character we very much want to see more of. The theme of the importance of perseverance, of picking oneself up when things don’t work out and trying again is well pitched for the audience, and this little snippet of growth mindset is an important one for children to hear. Wondrous! 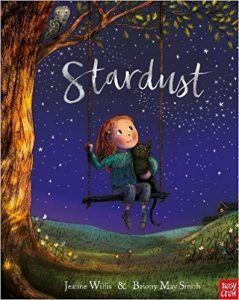 Wonderful autumnal colours adorn this inspiring tale of self-assurance, following one’s passion, and allowing oneself to step out of a sibling’s shadow. The relationship between the little girl and her grandad is touching and the empowering message, while it focuses on girls and particularly sisters, is a universal one. Briony May Smith brings Jeanne Willis’ text to life in a truly enchanting way. I love the sea spread, which is especially striking in the way it conveys light. There is a real sense of aspiration and love among the pages. The hardback edition is beautifully packaged with a lovely textured cover; this will make a lovely present for a new baby or Christening/Naming ceremony, particularly with its positive message that the wildest of dreams can become reality if you believe you can do it.